15/1 NBA Accumulator & Double land on Wednesday night! Our NBA Analyst has been on fire lately! 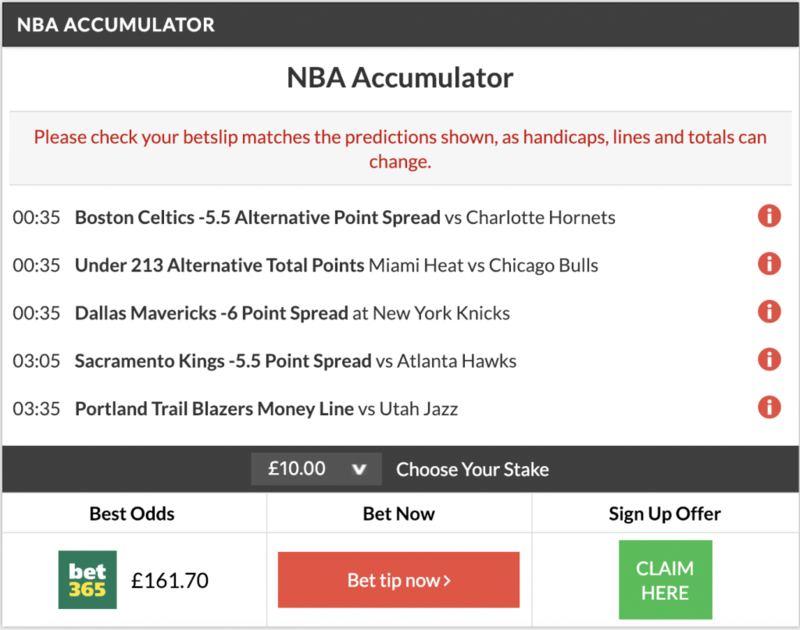 Just a few days after landing his 15/1 NBA Accumulator and Double, he has once again worked his magic and delivered another Acca + Double winner! The Boston Celtics started us off with a huge win over the Charlotte Hornets. In the end it was 126-94 in favour of the home team, which was more than enough for our -5.5 Point Spread here! We went for a low scoring game in our 2nd game of the acca between the Miami Heat and Chicago Bulls. With both teams struggling to score the ball this season it was a no-brainer and it showed. The game ended 105-89 in favour of the Bulls as the two teams combined for 194 pts only. The Dallas Mavericks had 5 players score in double figures at Madison Square Garden as they took care of business against the struggling New York Knicks. It finished 114-90 for only the 5th win on the road for Dallas this season in 25 attempts. Sacramento put up 135 points in a 22 point win over the Atlanta Hawks at home. We needed them to win by at least 6 pts and they delivered. The Kings are now 15-10 at home this season and are just two games out of the 8th and final playoff spot in the Western Conference. And finally the Portland Trail Blazers also had a huge win over the surging Utah Jazz. Led by Lillard and McCollum who combined for 66 pts between them in this one, Portland continued it’s impressive home form and won their 22nd home game out of 29 played, but more importantly landed our NBA Acca!! Make sure you are following our FREE NBA TIPS page so you don’t miss out on any future winners! Tips usually go up on the website in the afternoon hours!